Are you planning to paint your home's interior? If so, you may be feeling slightly confused about which paint hues to buy. You've heard that "go neutral" is the best advice -- but beige is not really your thing. You'd like something with a little more pizzazz, a colour scheme that reflects who you and your family really are ... oh, and maybe a shade to help your cramped kitchen seem a little larger. Most of all, you want colours that will simply make you happy. Try one of the following interior painting inspirations. Create a backdrop for the way you live. If you lead a very full and active life, consider a colour scheme based on soft, clean white. It will form a soothing backdrop for the paraphernalia of chalkboards crammed with messages and shopping lists, DIY projects, sports equipment, souvenirs of your travels, and the like. Or choose one of the new neutrals -- calm yet assertive tones like silver gray or pale olive. Personalize your space. What's your personality type? Are you a pensive dreamer or an energetic go-getter? Does your personal style tend more toward the timely and trendy or the elegantly classic? Express the inner you with the colours you choose to paint your home. Play with light. Your mood can be adversely affected when a room is too dark or, conversely, is overly full of harsh light. 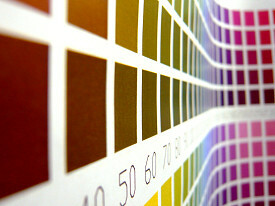 Use warmer or cooler shades of paint as a sort of virtual dimmer switch to adjust the effect. This technique can work equally well to visually enlarge a small space or make an enormous one less overwhelming. Make it cohesive. You will feel more harmonious and happy when your colour scheme flows throughout your home, especially if you have an open floor plan. This doesn't mean that every room has to be painted exactly the same. Instead, choose 3 or 4 basic colours and use them in different combinations and varying shades. Accent what you love. Highlight an outstanding element of your decor -- an architectural feature such as a beautifully formed cornice, your grandmother's beloved china cabinet, or a treasured piece of art. Paint your interior in the colours that will show it off best. Bring the outside in. Is gardening your passion? Or does your home face an unforgettable view? Bring all the impact of your blooming flowerbeds or the magnificent local landscape indoors by choosing paint in coordinating shades. Think daffodil or sea foam, perhaps. Channel movies or cartoons. Base your paint selections on images or personalities in popular movies or cartoons. One example might be Spiderman's iconic red and blue; another more modern one could be the blue and green of the heroes of Monsters Inc. This will create a light-hearted colour scheme for a children's room, nursery, or games room. Pick your favorite colour. We adults often feel just as strongly about our favorite colour as children do, although you might hesitate to base an entire decorating scheme on your particular preference. But why not? It's your home, after all. If your partner or other household members object to an all-lavender or all-black living room, use the hue you love to paint a single accent wall. Pick everyone's favorite colour. For the first time in 2016, the Pantone Institute selected not one, but two shades as colour of the Year, Rose Quartz and tranquil blue Serenity. Used together in your home, they will create a pleasant sensation of emotional balance, "reflecting connection and wellness as well as a soothing sense of order and peace," according to executive director Leatrice Eiseman. How much will your home’s spring makeover cost? Please feel free to contact us to ask for a quote for any sized job. You can either fill out the quote form provided or simply send me an email with an outline of your project details and where you are based. With more than 30 years experience in all aspects of painting and decorating we offer a quality level of service and look forward to having the opportunity of working with you. For a Free Quotation or Consultation, please contact us by phone or email or complete the Contact Form provided.